In 2006, Ugly dolls were awarded the Specialty Toy of the Year award by the Toy Industry of America. Then people started to concern more about this kind of toys. 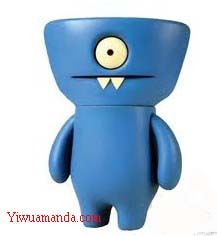 Ugly doll is a brand which began as a collection of best selling toys created by creators David Horvath and Sun-Min Kim. The ugly doll line was first launched in January 2001, and was distinguished by an aesthetic that balances traditional cuteness with perceived ugliness. Ugly doll is a kind of doll that looks unusual as the normal one, most of them are in special design, they are in special pictures, and some of them look abnormal. There are 3 standards of the ugly dolls: 12″ Ugly doll, 7″ Little Ugly, and 4″ keychain. There are many ugly doll characters that are interesting, and can grasp your eyes at first sight. Most of them are very cute, in different designs, they are very special. I’m sure this kind of doll can make you happy whatever your mood was.